Friday would be the last day that the delegation would be in Taraz before taking the night train to Almaty. A tour of the city was arranged for those who wished to go, so I was happy to go along and see some sights. One of our first stops was small mosque located on a hill overlooking the city. It wasn't particularly big, but it was in an ideal location, with nice views of the river and the town. We watched as a number of children waded into the water to cool off. Much to my surprise, a white SUV backed right into the river looking very much like the owner was giving it a cheap bath. It seemed a bit risky to me! We visited another holy place, this one located in what appeared to be a park. Again, we didn't go inside. On the same grounds some ancient ruins had been found and we saw several men excavating the site. An ancient temple had been restored, so we took a look inside. Next, it was off to the town square where we visited the local historical museum. It contained the usual artifacts, including a significant number of stone carvings that used to dot the countryside. Our official tour ended with lunch at a nearby restaurant. I ended up ordering pizza (different, but not bad), forgetting that I had been invited to a pizza party that night. After lunch, we broke into groups to visit the bazaar. I didn't really need to do any shopping, but thought it would be fun to soak up some atmosphere. I joined Randall and his daughter, along with their translator, Jenya. There were shops of every kind--from food to rugs to electrical goods. Randall's daughter wanted a special mat to lie on, so we got directions to a shop that sold them. She found one that she liked, and after some bargaining, bought it. Our time was about up, so we grabbed a taxi and headed back. I took a short break at the office, then several of us headed over to the Knouse's house for "family night." We enjoyed homemade pizza and watched a movie. Tonight was the last night that they would spend in the house (they were moving back to the States), so it was quite nice of them to open up the place to us. After the movie, everyone headed to the train station. The delegates would be taking the night train to Almaty. Most of the translators and many others joined in to wish the group farewell. Just like in a movie, those on the train waved goodbye from the windows as the train slowly chugged its way out of the station. This was the second set of good-byes that I had witnessed and I knew that there would be more to follow. Today I had nothing "official" on the schedule, but Sara asked if I would like to join her for lunch then later take the youngest two Knouse boys to the park in order to keep them occupied while their mom and dad packed. It was a nice day (so far, the weather has been much milder than I had expected), so I was happy to go along. The park was much bigger than I had anticipated, with a huge selection of carnival rides (similar to those found in "parking lot" carnivals in the States) and a variety of cafes and snack shops. Twelve-year-old Daniel and ten-year-old Caleb clearly maintained a certain rivalry, but managed to enjoy themselves as we rode the ferris wheel, the swings, bumper cars, and a small roller coaster. It wasn't particularly crowded, and one man typically operated more than one ride, waiting until someone showed up at the entrance before sauntering over. The hours went by quickly and we were soon back at the Knouse's house. Sara had offered to prepare dinner (hamburgers, salad, chips, etc.) for the family and for all of the guests that may show up. She explained that it is Kazakh tradition to stop by a departing family's home to offer them good wishes. It is also tradition that you have something to offer your guests when they arrive. Sure enough, neighbors and friends, some coming from a considerable distance, stopped by for the next few hours. I felt a bit uncomfortable that I was often the subject of the questions ("What year were you born?" again! 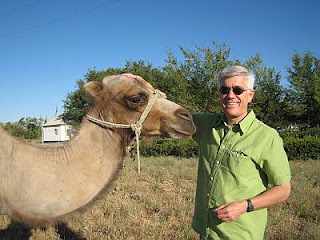 ), but the friendly nature of the guests quickly put me at ease. I was amazed that the Knouse's were able to pack and entertain guests at the same time. In the States, such a situation would induce much panic. For the second night in row, I went to the train station. Once again, a large crowd was present to say good-bye. I told the Knouse's that I felt a bit strange having just met them, yet being a part of such an important night in their lives. Interestingly, I was scheduled to move into their house the day after they moved out. As before, those departing waved good-bye from the windows of the massive train. It seemed that I was saying good-bye as often as I was saying hello. Tomorrow I anticipated another hello and good-bye; this time it would be with a second child that I sponsored. When I woke up this morning, I knew that today would be different in a couple of important respects. For one, I would be moving from the apartment at the office and into the Knouse's house. 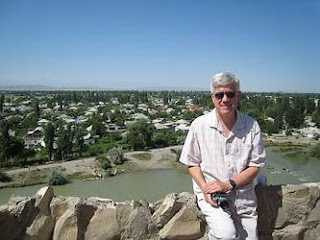 One of the Interlink staff, Ken, was also living there, but he was away in Almaty. 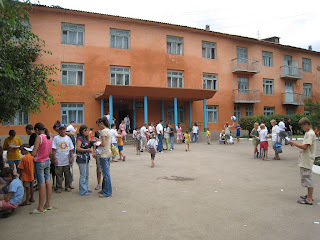 The second task for the day would be far more personal--Sara would be taking me to Ulan orphanage to visit with the second child that I sponsored, a boy named Oleg. Sara picked me up at the office and we head to Ulan, which was not far away and still within the city limits of Taraz. She suggested that we see if we could take Oleg to lunch and spend some time with him off campus. 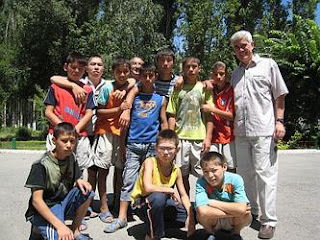 When we arrived at Ulan, there were a handful of boys hanging around outside along with a couple of caregivers. As it turned out, Oleg and his brother were spending the summer at the home of some relatives on the outskirts of the city. For the second time on a my trip, the orphan that I sponsored was away. Sara said that Interlink would be able to track him down and that perhaps we could visit later in the week. Naturally, I was disappointed that I wouldn't be able to see him today, but glad that Sara offered to try again. At that moment, some of the boys said that they knew where he lived and would be happy to take us there. Sara said that if they got permission from the caregivers, then we would be grateful to have them help us. With little persuasion, the caregivers said that it was okay. The trip to Oleg's took us on some very bumpy gravel roads to what appeared to me to be a small, somewhat run-down, village. We turned down a one-lane lane and stopped when the boys said that we had arrived. Would he be home? We were greeted by an older woman, who at first appeared surprised to see us, but then happily invited us in. She led us to the porch of what must have been the kitchen to a fly-covered table with the remnants of what must have been breakfast. An older man was stretched out on a nearby bed. He sat up as we seated ourselves. A baby girl in a scooter chair eyed us with interest. Oleg introduced himself then helped clear the table. He appeared slightly embarrassed at the state of the table and quickly cleaned it. The older woman insisted that we sit down and have some tea and bread. It turned out that she and the man were invalids. They were also the parents of Oleg's sister's husband. The baby was Oleg's sister's. While we were chatting, Oleg and the boys played with the girl and drew some water from the well just a few feet from the porch. I mixed some fresh raspberry jam into my tea and ate some bread. Sara translated and once again I was asked how old I was. I was now getting used to the question and to the fact that it was always in the form of "What year were you born?" I wondered what kind of life this woman and her husband had led. The lines etched into their faces seemed to indicate that it had been a difficult one. The man, only wearing shorts, joined us for some photos. After several more cups of tea, we asked if we could take Oleg and his brother out for the afternoon. She said that it was fine and invited us to see her house before she left. We walked across the courtyard into the small house. We walked through a small salon, and then what appeared to be two bedrooms, although there were no beds. Did they sleep on the floor? She showed me some old photos of her family. The house, despite it's size, was neat and clean. Oleg changed clothes and we headed for the SUV. We needed to get the other boys back to the orphanage and were actually running a bit late. Sara explained that the caregivers would understand that we had been invited for tea. We pulled up at Ulan and saw the caregiver that we had spoken to earlier. She thought that maybe Oleg and his brother would like to have a couple of their friends come along with us for the afternoon. The caregiver gave his consent and we headed off. We asked the boys if they wanted to go bowling or go to the park and ride some rides. They couldn't make up their minds and asked me to decide. Although I had been to the park the day before, I thought they would like it (and knew that I preferred being outside) and suggested that. They laughed and joked on the way and were clearly happy to be going out together. The first stop at the park was the very (by American standards) modest roller coaster. They laughed and screamed and even dared to hold up their hands for a moment. The rest of the afternoon was spent riding rides and eating snacks. I enjoyed the Kazakh version of a hotdog, with its cucumber salad topping. The boys were clearly having a good time, and I was happy that we had managed to find Oleg. As the afternoon came to a close, we loaded back into the car and returned to the orphanage. Oleg gave me a quick tour. Like Savva Orphanage, it was neat and clean. Oleg showed me his bed, complete with the Madrid sticker I had sent him at Christmas. We said our good-byes to the other boys and then headed back to Oleg's house. I gave him a backpack with some clothes and a soccer ball. He seemed pleased and surprised. I told him that I was happy to be his sponsor and that I was pleased that I had finally gotten to meet him. We posed for some photos and then said goodbye. I watched as Oleg and his brother walked down the gravel lane to their house and wondered what the future held for them. Oleg had actually graduated from 9th grade and would now move on to college. He told me that he wanted to be a lawyer. 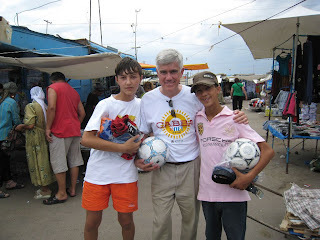 I told Sara that I would be happy to help Oleg and his brother as long as it was possible. I considered what their lives might have been had it not been for the fine people at Interlink Resources. 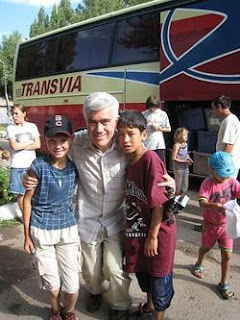 I also considered how my encounter with these children would change my life. It had been a good day. I woke up very early this morning because we had been invited to attend a "circumcision party" at 7 AM. A friend of Interlink, a Tae Kwan Do teacher named Ruslan, was hosting the event for his six year old son. Apparently, this was supposed to be quite an important occasion and Beth suggested that it would be a wonderful cultural opportunity for me as well as a good chance to get some video. I just hoped that I wouldn't be asked to videotape anything too personal! We were joined by an English teacher, Heather, and some Americans who would be helping her present at a conference. As we pulled up near the house, a large number of cars were parked along the street and I could see people milling around near the entrance. As I got out of the car, I wondered just what the morning would hold. 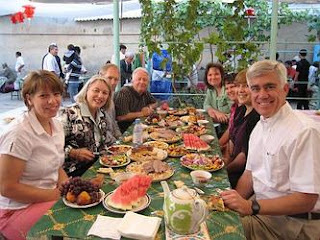 Ruslan's place seemed very nice and we were ushered into a large courtyard filled with colorfully decorated tables. It appeared that the men were on one side of the courtyard and the women on the other, but since we were guests we were allowed to sit as a mixed-gender group. The tables were completely covered with plates of food, ranging from salads to candy. An English-speaking relative of Ruslan's stood at the end of the table and served us. From time to time, music would begin playing and the women, some dressed in traditional Kazakh garb, would dance. To my surprise and great shock, Beth informed me that Ruslan wanted me to film the circumcision. I took a deep breath and considered what this might mean. I knew that I could not refuse and quickly began thinking of how I would handle the situation. I decided that I would use my wide-angle lens and stay as far out of the way as I could. For the rest of the meal, I tried to take my mind off what I had been asked to do, comforting myself only slightly by the fact that the boy would have it much worse than I would! The time arrived and Ruslan called me over. We slipped off our shoes before entering, then made our way to the salon. A group of men surrounded a mattress and blanket that had been prepared. To my great relief, Ruslan told me that I was only to tape before and after, but not during. To my further relief, I would be asked to step out of the room for the "during" part. Whew! As the boy entered, I was impressed at his composure. As the older men removed his trousers, he stared straight ahead, almost expressionless. I considered that a young boy in America facing such an ordeal would no doubt be screaming his head off. I decided to stay with my original idea of using a wide-angle lens and stood at the back of the room and taped as the men put the boy down on the mattress. The older men prayed, then I was dismissed. When I came back outside, I discovered that walnuts had been thrown all over the ground and on the tables. Apparently this was a fertility blessing of some sort, wishing everyone many sons. A few minutes later, I was called back into the salon. I wondered if the boy would be crying. When I came in, he looked very much as I had left him, with an expressionless stare. His older brother and a few of his friends were now beside him, looking at him with great interest. The other men were talking and smiling. I was informed that the older man next to the boy had performed all of the circumcisions in the village and was now training his son to do the same. I videotaped from a distance, then excused myself, never having imagined that I would be witnessing such an event. Upon my return outside I was peppered with questions and subject to just a bit of teasing. I ate some more food, then filmed a bit more dancing and cooking. After the dance, we said our good-byes. Ruslan thanked us for coming and said that we were always welcome at his house. Having now spent several days in Kazakhstan, I knew that he meant it. The celebrations were not over--now we were heading to a graduation ceremony at a local college. Several former Savva students would be graduating and Beth would be saying a few words. We arrived very early to set up a slide show and watch the MC's practice their dialogue. Music punctuated every introduction and it began to occur to me that this would no doubt be much different than the rather dry graduation ceremonies that I was used to. It ended up starting about an hour late (I suspected that we had gotten our times mixed up) and turned out to be very entertaining. There was singing and dancing, and each speaker was introduced with a blast of music. It seemed as though I was watching "Kazakh Idol" or something. Of course, I had no real idea what the speakers were saying, but I enjoyed all the music in between. The students were not dressed in caps or gowns, but just came from the audience as they were called. At the very end, a huge group of them came to the stage for their "closing number." The time went by quickly and I thought it was fun. It was hard to believe that a few hours earlier I had been video-taping a circumcision! Today was another early morning. Sara would be driving me to Shymkent, where we would be visiting the Interlink Resources center there. Originally we had planned to spend a couple of days there, but accommodation could not be arranged. Also, Beth had developed a cold, so everyone thought it best just to do a day trip. The morning was cool and bright, and I was relieved that the ultra hot temperatures that I had been told to expect had not materialized. The three hour journey was made a bit more interesting by the narrow, winding roads, which meant that we had to pass quite frequently. We also made a couple of stops, including one to see a lonely camel who seemed to be guarding a holy place. He didn't mind at all that I was invading his space and cooperated for some quick picture-taking. Much of the journey took place in the foothills of the mountains and made for some spectacular scenery from time to time. I was surprised at how quickly the time went. The Shymkent center was bigger than I expected and was composed of several large buildings. While the exterior was a bit rough, the interior was very neat and clean. The center hosted many English classes and housed a nice library. It was fun to speak English with most of the staff and to sense their enthusiasm for chatting with native English speakers such as Sara and I. We went from room to room videotaping and doing interviews with the staff. We also visited a cerebral palsy unit and videotaped an emotional appeal from one of the patient's mothers. Afterwards, we had lunch with the director of the center, a very kind man with a name that I cannot spell! 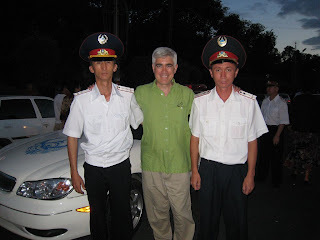 In a somewhat amusing fashion, he kept hinting that he wanted me to come to work with him in Shymkent. I wondered if someday I would. After lunch, we did a bit more taping, coming across some Americans who had come to Kazakhstan to adopt children. They were speaking with some students who clearly loved practicing their English and chatting with the foreigners. After leaving the center, we stopped at the home of Dr. Laurie, who had an office at Interlink but was at home that day. She had been in Kazakhstan for seven years and I marveled what grace God must have extended to this kind woman. I felt a bit guilty that my visit was only two weeks. We said goodbye and headed back to Taraz. We stopped at a couple of villages along the way, and I enjoyed the spectacle of seeing the cows come home. Their respective owners would meet them at an intersection and the cows would obediently turn down the road and go to the correct house. I had heard the expression many times, but until now I had never seen "the cows come home." Although long, it had been a good day. I thought about all the wonderful people that I had met. Would I ever see them again? I hoped so. The last couple of days my stomach has been just a bit dodgy, and I wondered what it was that might have caused it. Could it have been the ice cream that Sara (who also reported a funny tummy) and I had on the way back from Shymkent? In any case, it was just enough to be noticed, but not enough to stop me from doing anything. Beth, Olya, and I went to visit a few dentists who had gone to the States for training sponsored by Interlink. While no doubt very professional dentists, their offices were fairly old and not the sparkling clean places found back home. (I don't say this as a criticism, only an observation.) They were very grateful for the training that they had received and looked forward to working again with their American counterparts. I didn't ask, but wondered what a typical trip to the dentist would cost here. The last dentist that we visited, an older, blonde-haired lady, did not have an assistant or a receptionist, nor did she take appointments. You simply showed up and waited. When we arrived, there was no one waiting, and only one patient being treated. The dentist explained that the treatment would take a while, so she asked the woman to get up from the chair while we were doing our interview. I felt a bit bad that this woman had to wait, but I wasn't the one in charge! After returning to the office, I taped an interview with Olya, who was working with the Youth Impact program. The following day, I did another videotaping seminar to a group of young ladies and their teacher. The seminar was the same as the one I had done at Savva Orphanage last week and went well I thought. In the afternoon, Beth took me to a local university to videotape some more teacher-training sessions. The workshops were being run by a group of Americans who we had met earlier at the circumcision party. The videotaping went well, and the level of competence displayed by the students as they spoke English impressed me. The building itself was battered and beaten, the hallways grim and poorly lit. The classrooms were cramped, but functional. None of that mattered to the students or their teachers, who were clearly enjoying what they were doing. The next day, Friday, was a day off for the Fourth of July. While the Kazakhs don't celebrate the holiday, Beth explained that it was good to observe the traditional American holidays when so far from home. After lunch, many of the office staff and their families came by the house where we enjoyed hamburgers, french fries, watermelon, etc. Later, what started as an "egg toss" with water balloons, soon turned into a huge water fight with everyone ending up soaked. Using my camera as an excuse, I managed to stay fairly dry. The evening was capped off with a bonfire (including "some-mores") and some fireworks. It was good fun. The next day should be fun as well--we are heading back to Savva one more time. I woke up this morning with a certain amount of anticipation. Today we will be traveling to Savva Orphanage for a video-editing workshop. To be honest, while I am happy to do the workshop, seeing the kids one more time is what I'm really looking forward to. Sara and Ember arrived around 8:30 and we all enjoyed some pancakes cooked by breakfast chef Ken. I hadn't had a good pancake in ages, so it was a real treat. We drove to the office to pick up some equipment and meet our translator. There was only one problem--our translator wasn't there. We waited a while, then realized that she wasn't coming. Sara explained that in Kazakh culture it was perfectly acceptable for someone to back out of something that he or she had volunteered for. Ember made a quick call to Kiikzhan (one of the office staff) who not surprisingly agreed to translate. We picked him up and began our trek down the bumpy road to Savva. As usual, we had to do a lot of passing. Although it is the main road to Almaty, it is almost entirely two lane. The Kazakhs tend to be "bold" passers, and I witnessed more than just a few close calls. As we pulled up to the orphanage, I hoped that the editing workshop wouldn't prevent me from spending some time with the kids. We got out of the SUV and headed for the main building where some kids were engaged in some sort of jump-rope relay. Others, I was told, were playing soccer. Before I knew it, several familiar faces greeted me, including little Vadim, who had seemed to take a liking to me on my previous visit. He led me by the hand to a nearby bench and motioned for me to sit down. The crowd around me grew as I began to hand out some photos that I had printed for them. A few moments later I was asked to finish handing them out later so as not to disturb the game. I went inside the building where some confusion was ensuing regarding the use of the director's office for the workshop. When we finally gained access, there were a host of technology issues that prevented us from using the LCD projector that we had brought. In what seemed like just few minutes, we were called to lunch. We would have to finish setting up later. We enjoyed some tasty soup and then some rice. I wanted to get back to the equipment so as not to be caught unprepared, but there was little that I could do except to wait for everyone to finish. With 30 minutes before the seminar would start, we returned to make our final preparations. Adding to the fun, of course, was the fact that the entire process would require translation. We would also be using an English and a Russian version of the software. It's a long story, but I had to demonstrate software that I had never actually used before. I know what you're thinking--but trust me, there was no way around it! Thankfully, it was fairly intuitive and similar to other editing software that I had used before, so I felt only marginally apprehensive about using it. The participants, mostly staff members who had attended my last seminar at Savva, joined the director for the workshop. As it turned out, the director often interrupted, and a few things were quite difficult to translate properly, making for a sometimes frustrating hour. It all turned out okay in the end, and I hoped that that everyone got something from it. Now I was anxious to see the kids. As it turned out, it was quiet time and the caretaker was reluctant to let me disturb the kids. I tried to explain that this would be the last time that I would see them, but I'm not sure that she understood. In any case, Kiikzhan and Ember, with the help of a couple of the kids, led me from room to room to hand out photos and to say goodbye. They loved the photos, although I did feel bad that I didn't have photos of all the kids. There were many hugs and then it was time to leave. I was a bit disappointed that I had spent most of my time with the editing workshop, but nonetheless glad that I could see the kids one final time. Two of the kids, Stas and Daniel, ran to the gate and waved at us as we left. On the way home, we thought we would stop by Mukbar's house. When we arrived, we found that he had just left. 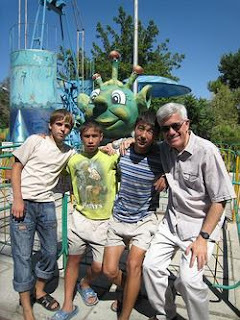 We were told that he had looked for us in the morning but then had to go to Almaty to visit his father. I was, of course, disappointed, but knew that there was little I could do. The ride home was, not surprisingly, just as action-packed as the ride there. Adding to the excitement was the fact that we got a flat tire and had to pull off the narrow road to change it. Kazakh drivers do not tend to slow down for vehicles on the side of the road, and I held my breath as the cars and truck zipped past Kiikzhan as he changed the tire. We were finally back on the road, and I looked forward to an uneventful remainder of the journey. The only other thing of note was the number of people we saw swimming in some rivers and canals. In one case, the water was flowing so quickly, the guy in the water looked like he would be swept away at any moment. After a few minutes and with some effort, he pulled himself out and rested near the edge. It wasn't long before we were home. Tomorrow will be the last day for me in Taraz. Sara and I will take the night train to Almaty, then spend one day sight-seeing. I will have been here nearly two-weeks. The time has flown by, and I already know that I will miss this place. My next, and most likely, final blog entry will probably be written when I return to Madrid. While I still had a couple of more days in Kazakhstan, I had mixed feelings about today, knowing that it would be my last in Taraz. After breakfast I began to organize my things so that when it came time to pack, it wouldn't take me very long. The rest of the day went by fairly quickly with "team time" with Beth, Sara, Ember, and Ken followed by a very nice home-cooked Mexican lunch. I also ended up reading the rest of the "airport book" that I had brought along. Finally, around 10 PM, we drove to the train station. This was my third trip there, but the first with me as a passenger. Sara would be joining me on the journey to Almaty because she had to meet the members of a new delegation that were arriving. As Sara, Beth, Ken, and I chatted on the platform, I was happy to see Kiikzhan peddle towards us with his bicycle. His friendly nature and almost constant smile had been real blessings to me on the trip, and I was flattered that he had chosen to see Sara and me off that night. The compartment itself consisted of four fold-down beds and a very small table near the window. I had taken overnight trains before and knew that it was unlikely that I would get much sleep. Sara and another woman took the top bunks, while a young guy and I took the bottom bunks. Thankfully, no one seemed to want to stay up very late so it wasn't long before we made our beds and climbed in. For a few minutes we enjoyed air-conditioning, but for some reason it was soon turned off and the rest of the night our cabin was quite stuffy and hot. I did manage some sleep, but the stuffy compartment and the poor state of the railroad tracks made it difficult indeed. 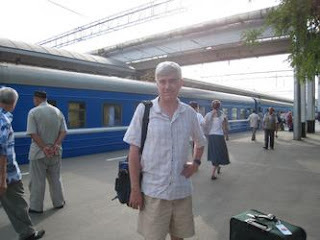 I was happy and relieved when we arrived at the Almaty train station the next morning. Sara hailed a taxi and we headed off to Teen Challenge, a drug-rehab center which also happened to run a small hotel. Sara told me that not only was it the best value in town, but it also was in a quiet neighborhood. The fifteen-minute drive went by quickly, and we were soon pulling up the wooded campus of Teen Challenge. My room was clean, comfortable, and quiet--just as Sara had described. I enjoyed a nice shower and some breakfast, happy to be free from the cramped train compartment. An hour or so later, a friend of Sara's arrived to drive us into town. He was a friendly guy, and Sara told me that he ran a clothing shop in the city. The roads were very smooth and Almaty was very much a modern city. The driver insisted that we stop by the "Mega Mall", a very upscale and fancy shopping center. We spent perhaps 20 minutes walking through it, and I wondered what the poor villagers that I had met in Taraz would think of it. We soon left and continued our mini-tour of the city. I've never cared much for soviet-style architecture, so as we drove through Almaty I wondered if I could ever live in such a place. Our plan was to drive to the base of Chi Bulak, a ski resort with very nice views of the city. Our driver bid us farewell and after an aborted attempt at lunch, we found ourselves in another vehicle racing through S-curves towards the resort. While the scenery was quite beautiful, we were going at such a speed that it was hard to concentrate on the view. I was happy when we arrived at Chi Bulak and escaped the vehicle. We enjoyed a nice lunch at the base of the ski lift, then bought our tickets and headed up on the ski-lift. The air temperature grew colder and colder with each meter we rose, and we saw several people in thick jackets (which you could rent). The ride, despite the now chilly air, was very beautiful. When we got off the ski-lift, we had the choice of continuing on two more lifts. As it turned out, there was a fair amount of fog, making a continued journey useless. We wondered around, snapping pictures of the resort below. It was nice to be out of the city and in the green mountains. The ride back down on the lift was just as nice as the ride up. With some apprehension we got back into the car driven by "Speed Racer" and flew back down. Sara, at my request, asked him to stop a couple of times for photos. He didn't seem to happy about it, but he complied. Back at the base, near a huge skating stadium, we hopped on a bus and headed into town. Earlier, I had mentioned to Sara that a couple of my former students at TASIS had once attended an American school in Almaty. She knew the principal of one such school, so we hailed a taxi to take a visit. As it turned out, it wasn't the same school, but the principal was quite nice and gave us a tour. The present campus was a bit old and cramped, but she explained that through a series of miraculous circumstances, God had blessed them with some new property and the money to build a new school. We headed back into the city-center to a pedestrian mall and looked around a bit. Our plan was to meet up with a friend of Sara's (a Kazakh woman who used to work at the Interlink office in Taraz) and a friend of a friend of mine (a Canadian guy who was good friends with a teaching colleague at ASM). We met Sara's friend first, then about an hour or so later, we met up with Albert and a lady friend that he had brought along. We enjoyed lively conversation and many laughs for the next several hours, ending our time with lots of pizza at a soviet-style pub nearby. Back at Teen Challenge, I said good-bye to Sara. She would be leaving at 1 AM to meet a delegation. I, on the other had, would have to get up about 4 AM so that I could get to the airport by 5 or so. I was a bit worried that my Teen Challenge driver would forget, but he was there with time to spare and in about 15 minutes I was in the airport, awaiting to board my KLM flight to Amsterdam. 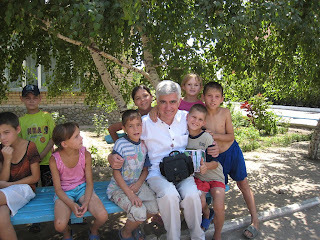 As I sat in the airport lounge, I considered what a heart-warming and enjoyable time I had spent in Kazakhstan. 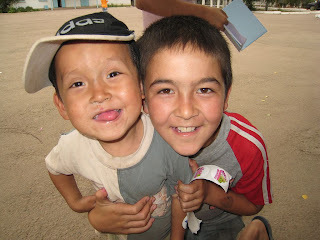 I thought about all the kind people at Interlink who spent each day helping others, I thought about the orphans at Savva and Ulan and wondered what the future held for them, and I thought about when I would return to this place. Soon, I hoped.